On the top of the assignments results overview page is an Export button. A CSV file will be generated and offered for download. This CSV file contains the results as visible for the submissions for the currently selected section(s). The Export button on the results overview page contains a dropdown menu. Click the small downward pointing triangle section of the button to open the menu. Only the scores for the currently selected sections(s) will be uploaded. It is possible to only upload scores for accepted or failed submissions, or both. Use the first two checkboxes on the upload form to chose exactly which scores to upload. At least one of these checkboxes must be selected to continue. 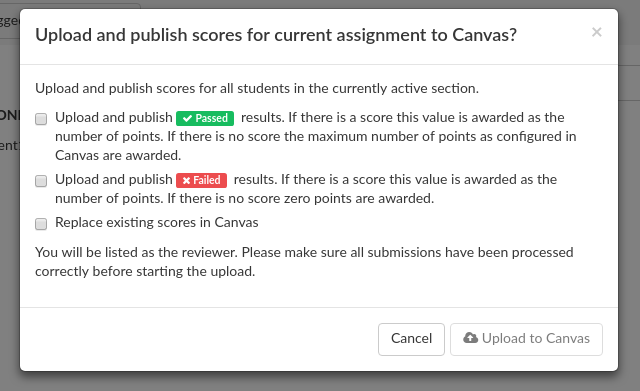 The last checkbox indicates whether submission for which a score is already available in Canvas should be uploaded again. Click the Upload to Canvas button to initiate the upload. The upload will commence immediately and will run in the background, there are no progress updates. It might take a short while for the scores to actually show up in Canvas.